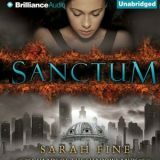 Sanctum by Sarah Fine is the first in the Guards of Shadowlands and it rocked my ears. 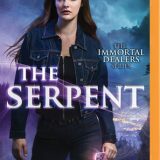 Last year I listened to Sarah Fine’s adult urban fantasy series Servants of Fae and loved them. Blogger friends proclaimed I had to listen/read her YA fantasy and I grabbed Sanctum narrated by Amy McFadden. From the world building to the swoony romance and dark corridors beyond the gate, I easily slipped into this world. 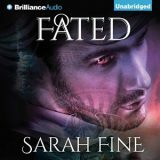 Fated by Sarah Fine is the final book in the Servants of Fate series. 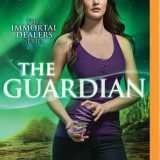 I listened to this series and loved the world and characters. This series was my first experience with Sarah Fine but rest assured we have begun a long-term relationship and I am eager to listen to her previously published books and the new ones yet to come. Brilliant, gut wrenching and action packed Fine did not hold back and Fated packed a punch. 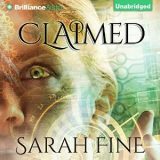 Claimed is the second book in the Servants of Fate series by Sarah Fine. 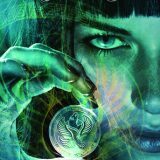 Claimed is an adult urban fantasy that is heavy on romance and laced with suspense and action making it perfect for an audio listen. From the world to the attacks on Galena Margolis, Claimed grabbed me and never let go. One of my goals for 2015 was to read a Sarah Fine book since so many of my blog friends recommend her. I chose to listen to Marked the first book in her Servants of Fate series and it left me craving more. Marked was well crafted with characters I rooted for and twists I never saw coming.